Vice Chair Joseph Buckelew, born in New Brunswick, New Jersey resides with his wife, the former Carol Applegate in Manasquan, New Jersey. He is the former owner of Buckelew & Associates and is presently Chairman of Conner Strong & Buckelew Companies, Inc.
Mr. Buckelew became Chairman of the New Jersey Sports and Exposition Authority on October 3, 2001. Prior to this Mr. Buckelew served as the Chairman of the New Jersey Highway Authority. 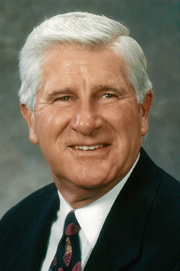 Mr. Buckelew was Chairman of Commerce Bank and Vice Chairman of Commerce Bank Insurance Services. In the past, he was Vice President of Seashore Broadcasting Corporation, radio station W.O.B.M. FM, and Vice President of North Shore Broadcasting Corporation W.O.B.M. AM for 30 years. He was on the Board of Directors of Commerce Bank/Shore, N.A. and Former Vice Chairman of the Board of Directors of Jersey Shore Savings & Loan Association. He is the former Chairman of the Ocean County Board of Elections and of the Ocean County Pollution Control Financing Authority. In the past he was Chairman of the Ocean County College Foundation and a Member of the Committee and Vice Chairman of the Kimball Medical Center Foundation, Inc. He is also on the Board of Trustees of Saint Barnabas Health Care System. Mr. Buckelew is a past President of the Ocean/Monmouth County Chapter of the Independent Fee Appraisers and is presently a Member of the National Association of Independent Insurance Agents. He is also a member of the Professional Insurance Agents, the Ocean County Board of Realtors and the Independent Insurance Agents of Ocean County. He received Honorary Degrees from Monmouth University for Doctor of Public Service and Georgian Court University for Doctor of Humane Letters. Mr. Buckelew is the recipient of many awards including the “Good Scout Award” from the Ocean County Council Boys Scouts of America; “Man of the Year Award” from the National Counsel on Alcoholism of Ocean County; “Brotherhood Award” from the Monmouth/Ocean County Chapter of the Monmouth/Ocean Development Council; “Humanitarian Award” from the Ocean County College Foundation; recipient of the “Humanitarian Award” Kimball Medical Center; Trustee of the Year Award from the NJ Hospital Association and is also the recipient of the Man of the Year Award from B’nai B’rith Organization. He was recently honored by The New Jersey Highway Authority with the dedication of the Joseph E. Buckelew Transportation Center. He is also a former Member of the Mayor’s Task Force on Narcotics in Lakewood; a former Township Police Officer; and Police Commissioner. Mr. Buckelew is past President of the Lakewood Board of Health and past Director of the Lakewood Y.M.C.A. He helped found the Lakewood Biddy League. He is a member of the Lakewood Black Hawks, Lakewood Lions Club and the American Legion. Mr. Buckelew has two sons, Brian and Kevin. Brian is a Vice President/Private Banker for TD Bank. Kevin is President of the Buckelew Title Agency. Mr. Buckelew has six grandchildren, Alixandra, Jonathan, Eric, Jillian, Lindsay and Jake. As an avid outdoorsman, he counts golf, tennis and jogging among his favorite sports.